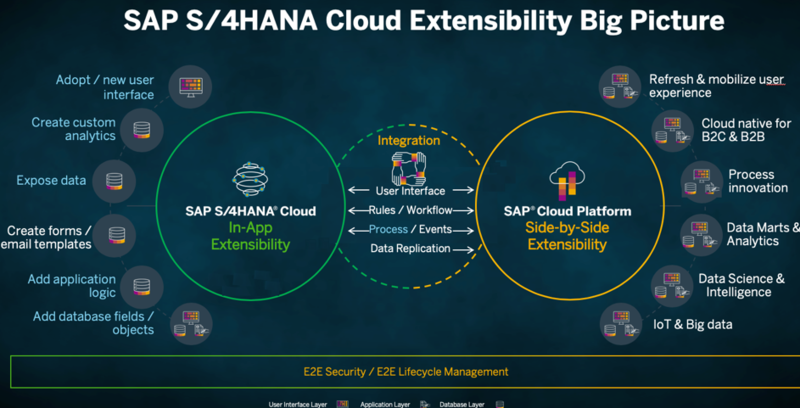 I am planning to provide a series of blogs tacking care on the topic of SAP S/4HANA Cloud Extensibility. In the first blog I will provide a summary of the scenario and set the frame. In the following days I will publish a series of blog posts regarding the technical setup. All the technical setups will be based on one business scenario. At the end I will provide a summary blog post showing how the extended process will look like. The individual blog posts will be published according to the numbering at the end of the blog. Extensibility is an important topic. Especially in a cloud environment, where the access to the backend system is not possible for business users and developers. Still SAP needs to provide options for customers and partners to build extensions. This blog aims to show a lot of In-app extensibility options in the context of one business scenario. 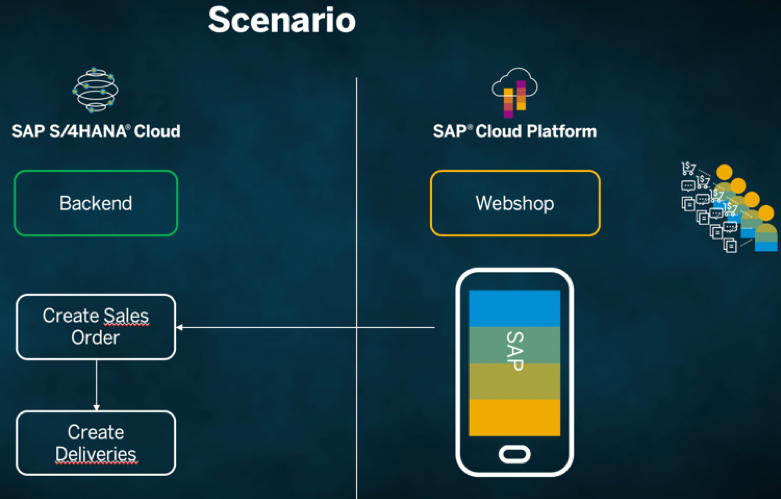 Above you see the Big Picture of Extensibility for SAP S/4HANA Cloud. The blog covers all points that are in blue. As you see the focus is on In-App extensibility. I want to sell smart phone covers. Everybody should be able to purchase these smartphone covers so they should be sold via a web shop. The web shop would be a perfect example for a custom app build as a Side-by-Side extension. The blog does not want to focus on building the Side-by-Side Extension but on In-App extensibility. The Side-by-Side part is represented by a tool called postman which allows me to perform API calls. The special thing for our smart phone covers is that customers can put an engraving on the cover, like their name. The engraving field is not a standard field. 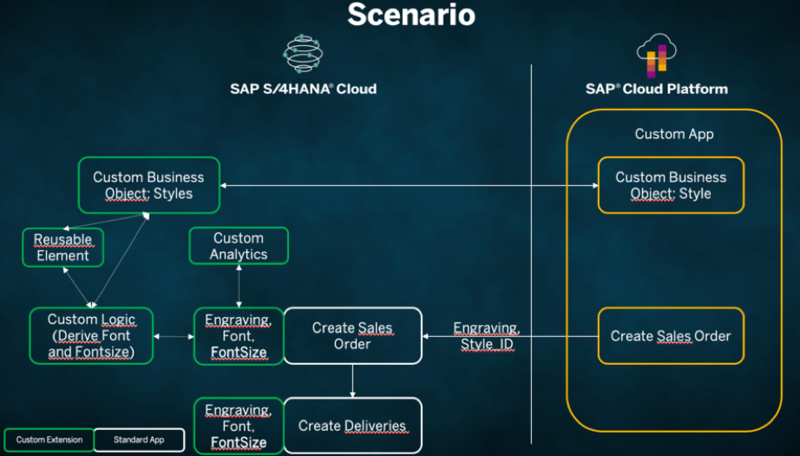 Therefore i need to extend the SAP S/4HANA Cloud application on the UI, the API level, as well as the business logic layer. I want this engraving to be visible in the sales order on item level, as well as on the corresponding delivery item. With the engraving you define also a certain style of the layout. In the S4HC system we define a custom business object that acts as a lookup table and that is used to fill the font and font size that we also want to see on the sales order item. Besides the above main scenario, we also want to read the available styles from the custom business object and be able to add new styles from the postman. On top of this we also want to do some custom analytics showing the Net Values of the Sales Orders and which engraving created which Net Value. This section describes what technically needs to be setup where, why and how. The last blog post will describe how the business process looks like after we have extended it. This blog shows a lot of the In-App Extensibility tools and their capabilities based on one business scenario. The blog outlines that the In-App Extensibility tools are powerful, easy to consume and life cycle stable.